American-made 7.62x39 ammo, complete with reloadable brass cases? It's time to hit the range! This 7.62x39 ammunition is loaded with a 123 grain full metal jacket projectile. It's a great load for range training or plinking and in your AK-47, you're going to get reliable feeding, ejection and overall performance. 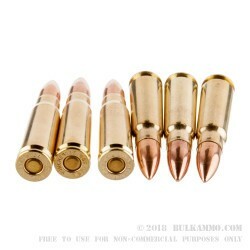 With boxer primers and brass casings, these rounds are also a great choice for reloaders. This load screams out of the rifle at a muzzle velocity of 2,355 feet per second and delivers muzzle energy of 1509 foot pounds. In this package, you'll get 20 rounds that are ready to load up and hit the range. Need something with a more sophisticated bullet for your next hunting trip or for self defense? 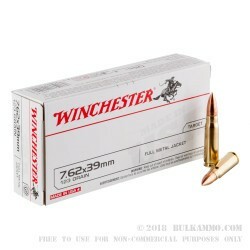 We suggest Winchester's 7.62x39 Super-X, available here. If you've been shooting for long (and likely even if you haven't) you've heard of Winchester. You know them for their quality - that's how they've managed to equip the military, hunters and civilian shooters for more than a century. 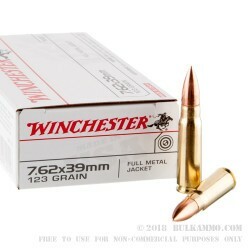 Based in the United States, it should come as no surprise Winchester makes this AK-47 ammo right in the heart of America.